As you’ve all probably gathered by now, I love NYC. Not only is it my fave city in the whole world, it’s the city I want to live in. The museums, the restaurants, the shopping, the architecture, the noise, the crowds…I adore it all. Did I mention the food?? One of my favorite places to go when I visit is BabyCakes, the famed vegan and gluten-free NYC bakery, with locations in LA and Disney World too. Not only do they bake delicious and heavenly cupcakes, they also serve the most decadent doughnuts and yummy cookies. Knowing my love for these delectable treats, my bestie bought me the BabyCakes cookbook for Christmas. As one of the number one requests was for me to cook and blog about breakfast and brunch recipes, I thought this presented the perfect opportunity to bake their scrumptious scones. If baking intimidates you, this easy recipe will ease your jitters. A cross between a chewy biscuit and a delicate muffin with a fusion of savory and sweet, scones are a delicious addition to breakfast, brunch or afternoon tea. The coconut oil, agave nectar and vanilla all imbue sweetness. As a side-note, with a flavor like a very mild maple syrup, agave nectar makes the perfect substitute for honey. As Erin McKenna, cookbook author and purveyor of the bakery, says, tart raspberries impart a nice tanginess to these sweet scones. Take a home a piece of NYC with every bite. Note: I used all-purpose flour as I didn’t have spelt flour (which is gluten-free). The recipe in the cookbook calls for coconut oil, which I used when I baked these yummies. The linked recipe calls for canola oil instead. 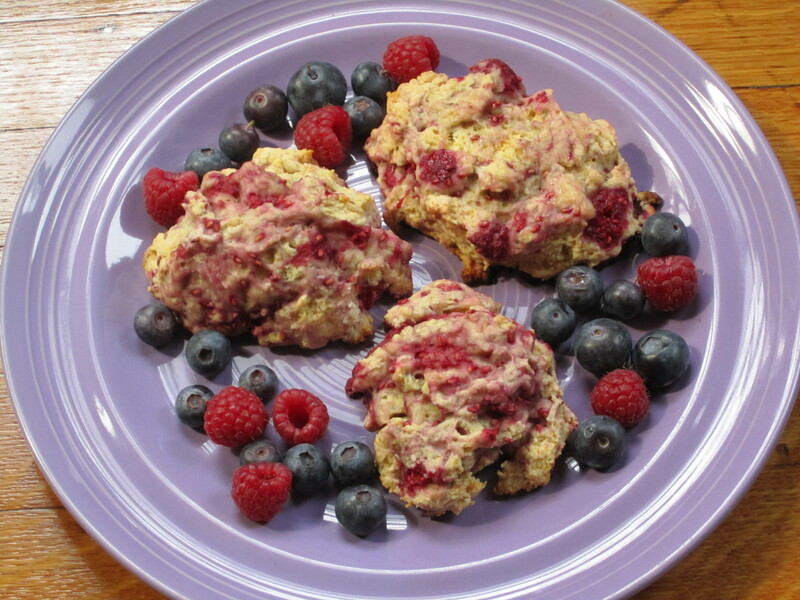 Tags: breakfast, dessert, food, Meat-Free Monday, Meatless Monday, raspberry, recipe, scones, vegan. Bookmark the permalink. Previous post ← Happy Birthday to Me: The Opinioness Celebrates 1-Year Anniversary with Not One But Two Giveaways! I love how those are just bursting with berries!